What did I just watch? I’ve never seen anything quite like The Anger in Ernest and Ernestine, playing at The Young Centre For The Performing Arts. I was expecting a simple comedic two-hander and instead got a package so stuffed with little treats and surprises, I couldn’t pull my eyes away for fear I would miss something. This play is about the evolution of a couple’s relationship. From dating and being madly in love, to marriage and the realization that they are opposites. The Anger in Ernest and Ernestine feels a bit like a sitcom. It has quick little scenes, a peppy underscoring of music and likeable and quirky characters who encounter funny situations while sharing the same common environment. Their dismal basement apartment, designed by Shannon Lea Doyle was the perfect backdrop for this play. The splashes of colour she incorporated into the set gave it a dynamic aspect that made it feel like it was another living and breathing thing unto itself. Right off the bat I knew this show wasn’t going to be anything conventional. It is described as a “physically rigorous” and “cracked romantic comedy,” and boy is that ever true. Having read that the show was developed through a series of improvisations by its writers Leah Cherniak (who directed this production), Robert Morgan, and Martha Ross, I was looking for how that helped contribute to the structure. I was able to pick out a few of the improv elements throughout. There were some “asides to the audience,” where the characters would include us in their world, and there were some clear “game of the scene” moments, when patterns were established and repeated several times for comedic effect. This play also incorporates a lot of clown work. Ernest, played by Gregory Prest and Ernestine, played by Raquel Duffy were such a joy to watch. The conflicts they would encounter within themselves and toward each other were perfectly punctuated through clowning by elevating the slightly absurd in their idiosyncratic behaviour. Duffy instantly reminded me of the great Carol Burnett. Her comedic timing, physical comedy, energy and gusto were contagious. She never held anything back, and I’m pretty sure she logged a marathon in all the running she did. There was one scene in particular that had me leaning in for more, a funny bit where she awaits Ernest, who is late. The emotional shifts she goes through in that one scene alone were varied, and the clarity with which she accomplishes this is what impresses. Prest is endearing as the slightly obsessive compulsive Ernest, who for a lot of the show fights back his dismay for Ernestine’s chaos. This internal struggle he battles manifests itself in his body and contained reactions; you could almost liken him to a ticking time bomb ready to explode. In watching him try to contain that, a lot of comedy ensues. He has a nice arc as a character and it’s fun to watch him evolve throughout the play. At intermission, I could hear a few conversations between patrons and how they could see themselves in the characters. Even I was sitting there laughing to myself as I watched myself being reflected back to me. In that respect, this play is completely identifiable in the most darkly humorous way, because even though we can laugh at what we see, we know there are ramifications within the conflicts themselves. 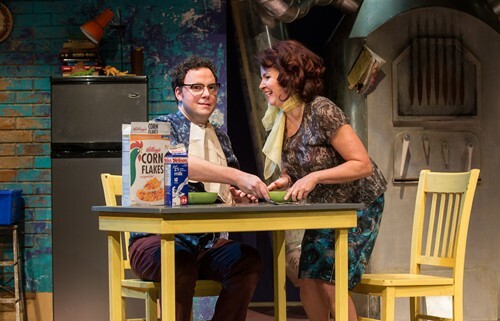 The Anger in Ernest and Ernestine is a charming play in so many ways. You find yourself rooting for the two characters to work out their differences while simultaneously enjoying watching them struggle. It’s such a pleasing yet strange middle ground to sit on. I love being shown something in a new light, and even though this story may have been told before, I felt it was uniquely done due to its added elements of clown and improv. If you enjoy something a bit different than the norm, as I do, then this play is for you. Please note: online ticket sales end 90 minutes prior to performance and therefore the performance will no longer appear in the calendar. For last minute sales or inquiries please call the box office at 416-866-8666 or visit in person.